Q1. What are the programs offered by Cambridge Montessori Preschool? Q2. Why should I choose Cambridge Montessori Pre School? Ans:Cambridge Montessori Pre School is poised to create a learning environment for tiny tots based on internationally renowned Montessori philosophy propounded by Dr. Maria Montessori. 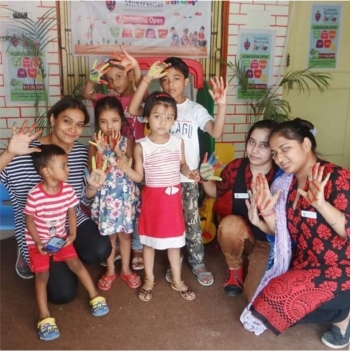 The school develops an excellent Montessori curriculum sourced and researched from across the globe and delivered with the help of operational centers in Indian sub-continent. For parents who want a balanced approach to educate their child in mind, body and spirit, Cambridge Montessori Pre School provides a challenging arts-integrated curriculum in a healthy, joyful and stress free environment. Q3. What is the method of teaching in Cambridge Montessori Pre School? Q4. What is the admission procedure at Cambridge Montessori Pre School? Ans:Parents can visit the nearest preschool branch and have a word with the principal/counselor. This would help them understand the facilities at our centre and experience the environment where we nurture young minds. Q5. At what age should I admit my child to Cambridge Montessori Preschool Pre School? 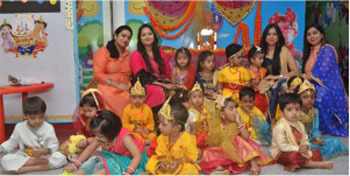 Ans:The best time for admission of your child is at the age of 1 – 2 years. Early years are critical for a child’s development and at this stage the child is exposed to learning and development opportunities. Q6. Does Cambridge Montessori Pre School admit children during mid-year in a preschool program? Ans:Yes, children can be admitted during mid-year for Tender hearts and nursery. Q7. Does my child have to be toilet trained? Ans:No, we have diaper changing facilities in every classroom. Q8. What is the teacher-student ratio at Cambridge Montessori Pre School? Q9. What is the medium of instruction at Cambridge Montessori Pre School? Ans:Medium of instruction is English. Q10. Is there a transfer policy at Cambridge Montessori Pre School? Ans:Yes, Children can be transferred from one branch to another along with the school kit without any charges. Q11. Are there any interviews for admission process? Q12. What are the safety and security at CMPS? Ans:At Cambridge Montessori Pre School, safety and security of our children is the top most priority. We have an exhaustive list on safety and security compliance measures which all our centres need to follow. These measures include school premises under CCTV surveillance, verification of staff, restricted entry into the school, teachers training on incident management, availability of fire extinguishers and first aid kit. Q13. What are your teacher’s qualifications? Ans:The teachers we recruit are qualified with degrees and are trained before embarking on the children role. Quality of teachers is not compromised at CMPS.